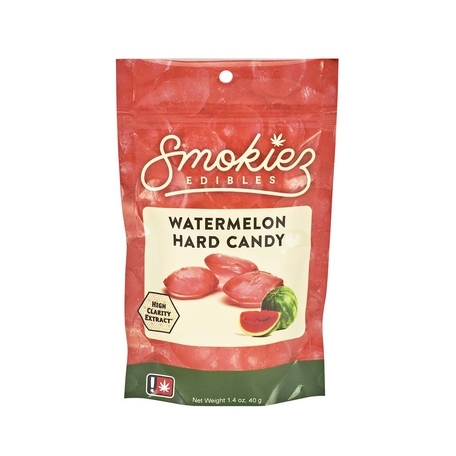 Sign Up for free to save time shopping Smokiez Edibles's wholesale products on LeafLink. 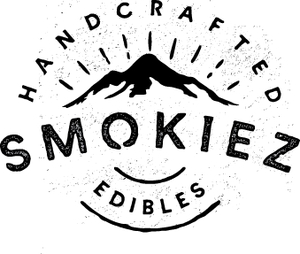 All Smokiez Edibles are sold in cases of 10. 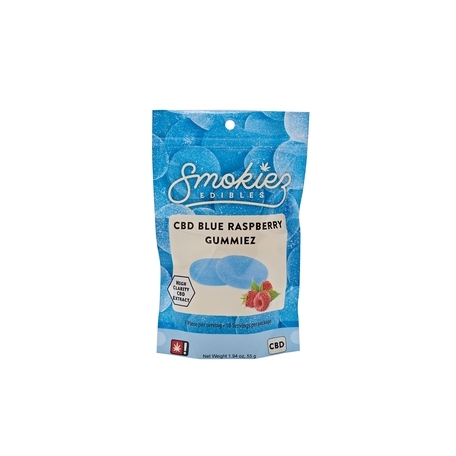 Smokiez Edibles Jamberry Gummiez -Enjoy the flavors of blue berries, raspberries, and strawberries in one delicious bite. 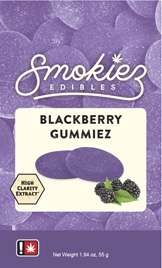 Smokiez Edibles Blackberry Gummiez -Enjoy the delicious flavor of fresh blackberries picked straight from the vine. 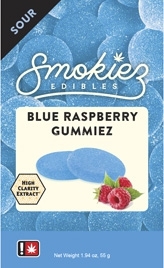 Smokiez Edibles Blue Raspberry Gummiez -Enjoy the delicious flavor of fresh raspberries picked straight from the vine. 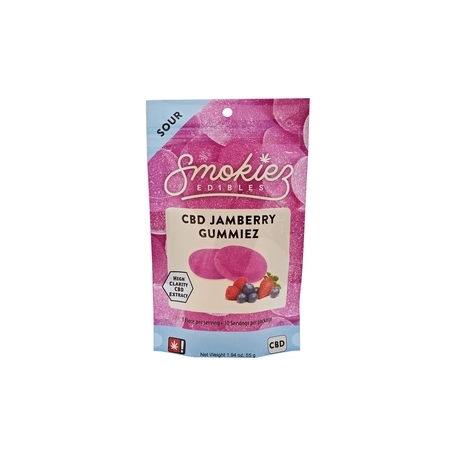 Smokiez Edibles Sour Jamberry Gummiez -Enjoy the flavors of blue berries, raspberries, and strawberries in one delicious bite with the sour twist everyone loves. 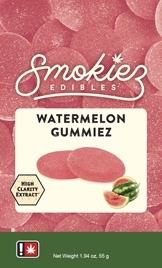 Smokiez Edibles Watermelon Gummiez -Enjoy the delicious flavor of watermelons right off the vine. 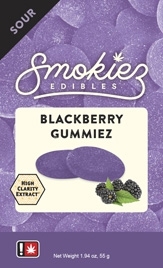 Smokiez Edibles Blackberry Gummiez -Enjoy the delicious flavor of fresh blackberries picked straight from the vine. 10 Gummiez pieces with 5mg of active THC in each piece, approx. 50mg/ package. 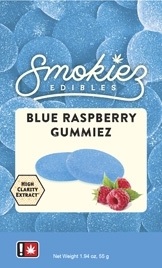 Smokiez Edibles Blue Raspberry Gummiez -Enjoy the delicious flavor of fresh raspberries picked straight from the vine. 10 Gummiez pieces with 5mg of active THC in each piece, approx. 50mg/ package. 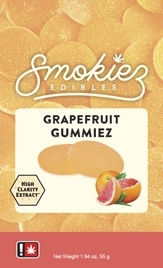 Smokiez Edibles Grapefruit Gummiez -Enjoy the delicious flavor of sweet and tangy grapefruit picked straight from the tree. 10 Gummiez pieces with 5mg of active THC in each piece, approx. 50mg/ package. 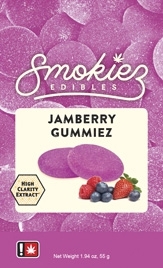 Smokiez Edibles Jamberry Gummiez -Enjoy the flavors of blue berries, raspberries, and strawberries in one delicious bite. 10 Gummiez pieces with 5mg of active THC in each piece, approx. 50mg/ package. 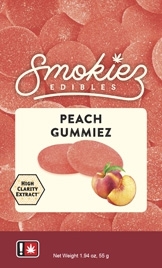 Smokiez Edibles Peach Gummiez -Enjoy the delicious flavor of juicy Georgia peaches picked straight from the tree. 10 Gummiez pieces with 5mg of active THC in each piece, approx. 50mg/ package. 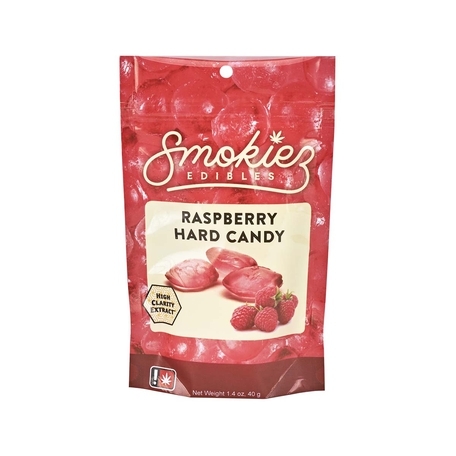 Smokiez Edibles Sour Blackberry Gummiez -Enjoy the delicious flavor of fresh blackberries picked straight from the vine with the sour twist everyone loves. 10 Gummiez pieces with 5mg of active THC in each piece, approx. 50mg/ package. 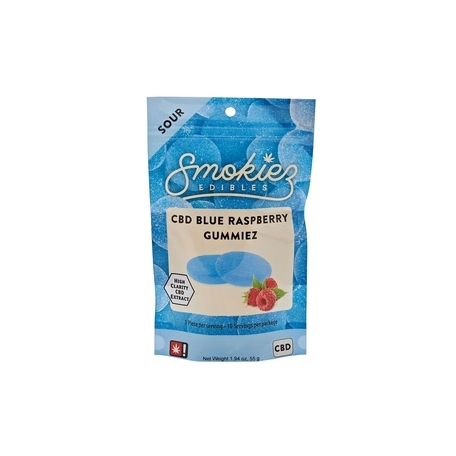 Smokiez Edibles Sour Blue Raspberry Gummiez -Enjoy the delicious flavor of fresh raspberries picked straight from the vine with the sour twist everyone loves. 10 Gummiez pieces with 5mg of active THC in each piece, approx. 50mg/ package. 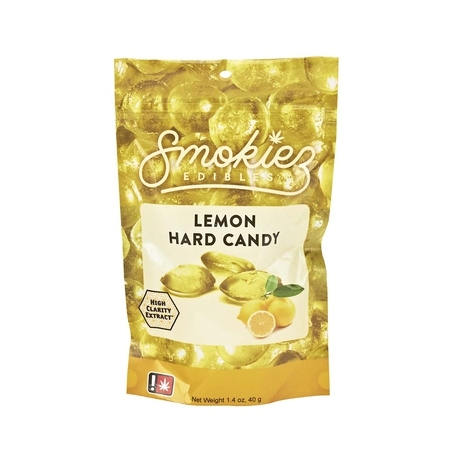 Smokiez Edibles Sour Grapefruit Gummiez -Enjoy the delicious flavor of sweet and tangy grapefruit picked straight from the tree with the sour twist everyone loves. 10 Gummiez pieces with 5mg of active THC in each piece, approx. 50mg/ package. 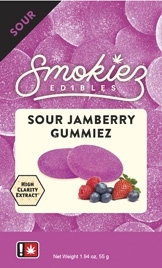 Smokiez Edibles Sour Jamberry Gummiez -Enjoy the flavors of blue berries, raspberries, and strawberries in one delicious bite with the sour twist everyone loves. 10 Gummiez pieces with 5mg of active THC in each piece, approx. 50mg/ package. 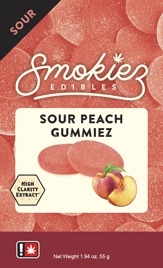 Smokiez Edibles Sour Peach Gummiez -Enjoy the delicious flavor of juicy Georgia peaches picked straight from the tree with the sour twist everyone loves. 10 Gummiez pieces with 5mg of active THC in each piece, approx. 50mg/ package. 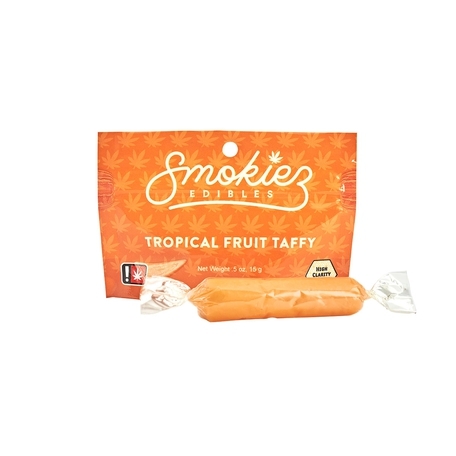 Smokiez Edibles Sour Tropical Gummiez -Enjoy a delicious blend of all the fruit flavors of the tropics with the sour twist everyone loves. 10 Gummiez pieces with 5mg of active THC in each piece, approx. 50mg/ package. Smokiez Edibles Sour Watermelon Gummiez -Enjoy the delicious flavor of watermelons right off the vine with the sour twist everyone loves. 10 Gummiez pieces with 5mg of active THC in each piece, approx. 50mg/ package. 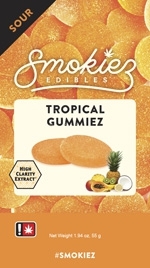 Smokiez Edibles Tropical Gummiez -Enjoy a delicious blend of all the fruit flavors of the tropics. 10 Gummiez pieces with 5mg of active THC in each piece, approx. 50mg/ package. 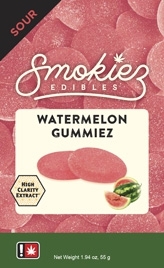 Smokiez Edibles Watermelon Gummiez -Enjoy the delicious flavor of watermelons right off the vine. 10 Gummiez pieces with 5mg of active THC in each piece, approx. 50mg/ package. 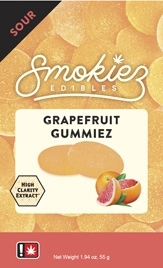 Smokiez Edibles Grapefruit Gummiez 1pc 50mg 1:1 THC:CBD blend -Enjoy the delicious flavor of sweet and tangy grapefruit picked straight from the tree. 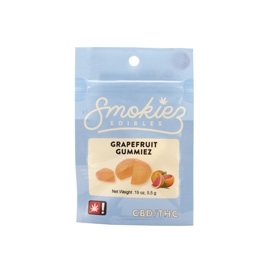 1 Gummiez piece with 10, 5mg servings of active THC/CBD, approx. 50mg total cannabinoids per package. 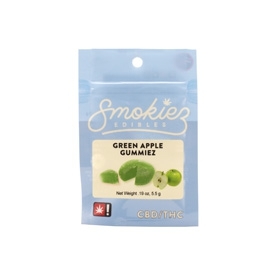 Smokiez Edibles Green Apple Gummiez 1pc 50mg 1:1 THC:CBD blend -Enjoy the delicious flavor of sweet and tangy green apples. 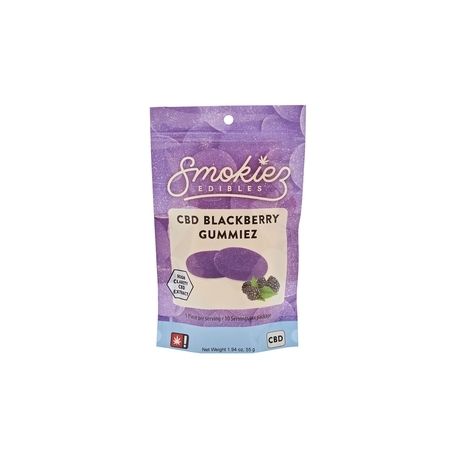 1 Gummiez piece with 10, 5mg servings of active THC/CBD, approx. 50mg total cannabinoids per package. Smokiez Edibles Sour Grapefruit Gummiez 1pc 50mg 1:1 THC:CBD blend -Enjoy the delicious flavor of sweet and tangy grapefruit picked straight from the tree with the sour twist everyone loves. 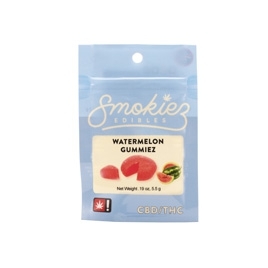 1 Gummiez piece with 10, 5mg servings of active THC/CBD, approx. 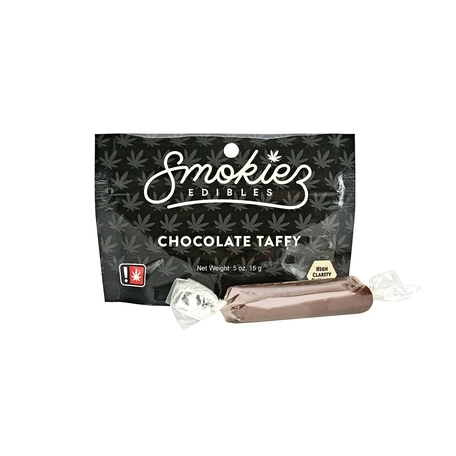 50mg total cannabinoids per package. 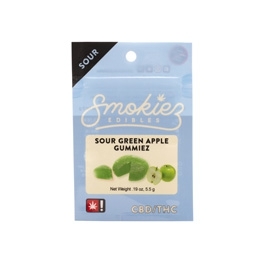 Smokiez Edibles Sour Green Apple Gummiez 1pc 50mg 1:1 THC:CBD blend -Enjoy the delicious flavor of sweet and tangy green apples with the sour twist everyone loves. 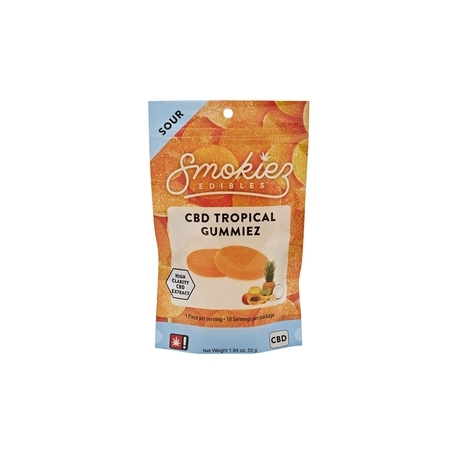 1 Gummiez piece with 10, 5mg servings of active THC/CBD, approx. 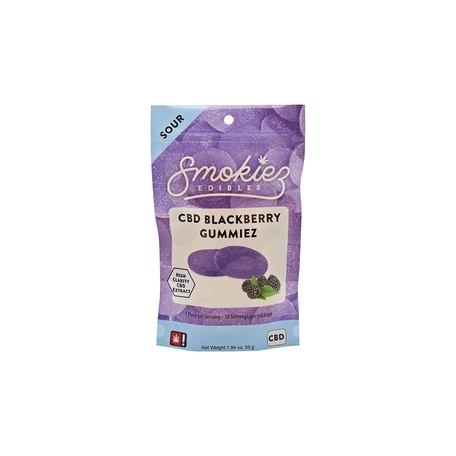 50mg total cannabinoids per package. 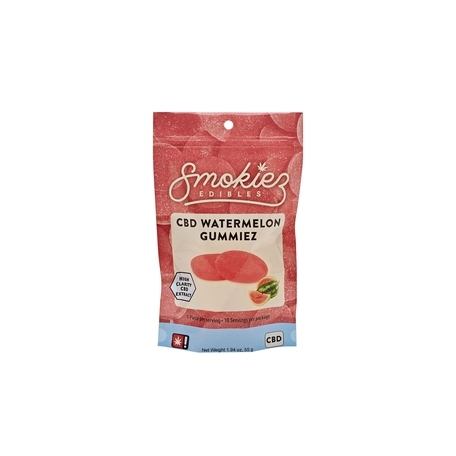 Smokiez Edibles Sour Watermelon Gummiez 1pc 50mg 1:1 THC:CBD blend -Enjoy the delicious flavor of watermelon right off the vine with the sour twist everyone loves. 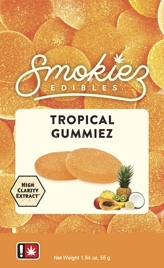 1 Gummiez piece with 10, 5mg servings of active THC/CBD, approx. 50mg total cannabinoids per package. 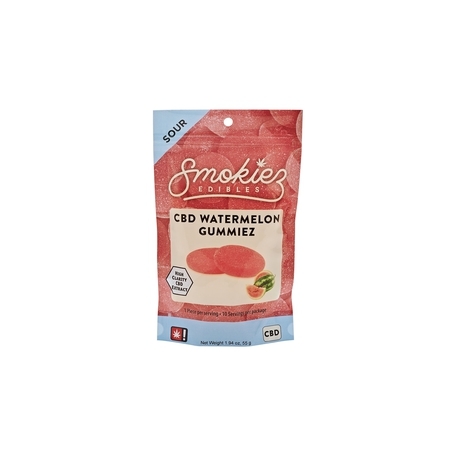 Smokiez Edibles Watermelon Gummiez 1pc 50mg 1:1 THC:CBD blend -Enjoy the delicious flavor of watermelon right off the vine. 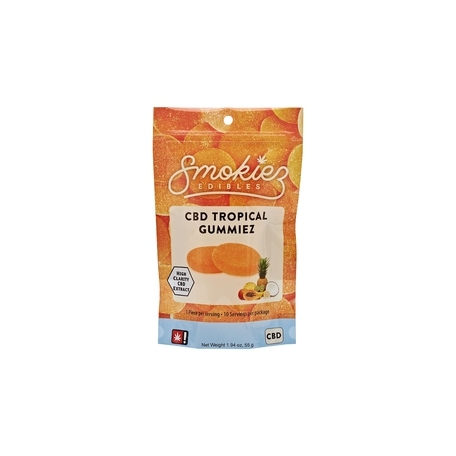 1 Gummiez piece with 10, 5mg servings of active THC/CBD, approx. 50mg total cannabinoids per package. 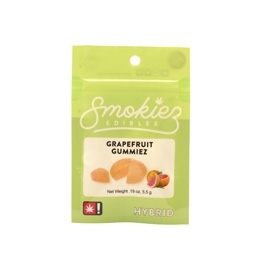 Smokiez Edibles Grapefruit Gummiez 1pc 50mg HYBRID-Enjoy the delicious flavor of sweet and tangy grapefruit picked straight from the tree. 1 Gummiez piece with 10, 5mg servings of active THC, approx. 50mg/ package. 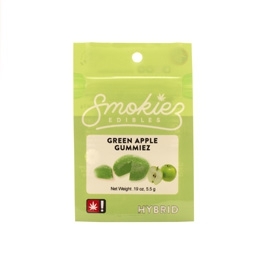 Smokiez Edibles Green Apple Gummiez 1pc 50mg HYBRID-Enjoy the delicious flavor of sweet and tangy green apples. 1 Gummiez piece with 10, 5mg servings of active THC, approx. 50mg/ package. Smokiez Edibles Sour Grapefruit Gummiez 1pc 50mg HYBRID-Enjoy the delicious flavor of sweet and tangy grapefruit picked straight from the tree with the sour twist everyone loves. 1 Gummiez piece with 10, 5mg servings of active THC, approx. 50mg/ package. Smokiez Edibles Sour Green Apple Gummiez 1pc 50mg HYBRID-Enjoy the delicious flavor of sweet and tangy green apples picked straight from the tree with the sour twist everyone loves. 1 Gummiez piece with 10, 5mg servings of active THC, approx. 50mg/ package. 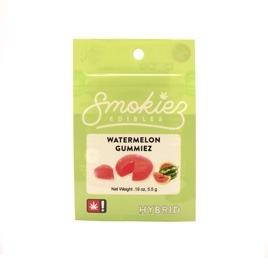 Smokiez Edibles Watermelon Gummiez 1pc 50mg HYBRID-Enjoy the delicious flavor of watermelon right off the vine. 1 Gummiez piece with 10, 5mg servings of active THC, approx. 50mg/ package. Smokiez Edibles Sour Grapefruit Gummiez 1pc 50mg INDICA-Enjoy the delicious flavor of sweet and tangy grapefruit picked straight from the tree with the sour twist everyone loves. 1 Gummiez piece with 10, 5mg servings of active THC, approx. 50mg/ package. 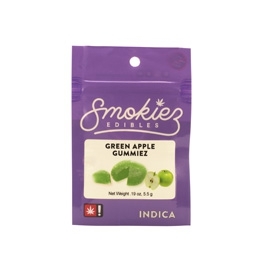 Smokiez Edibles Green Apple Gummiez 1pc 50mg INDICA-Enjoy the delicious flavor of sweet and tangy green apples. 1 Gummiez piece with 10, 5mg servings of active THC, approx. 50mg/ package. Smokiez Edibles Sour Green Apple Gummiez 1pc 50mg INDICA-Enjoy the delicious flavor of sweet and tangy green apples with the sour twist everyone loves. 1 Gummiez piece with 10, 5mg servings of active THC, approx. 50mg/ package. 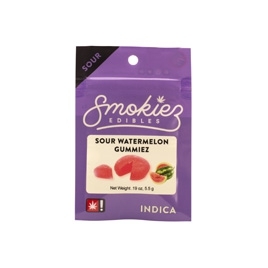 Smokiez Edibles Sour Grapefruit Gummiez 1pc 50mg INDICA-Enjoy the delicious flavor of watermelon right off the vine with the sour twist everyone loves. 1 Gummiez piece with 10, 5mg servings of active THC, approx. 50mg/ package. Smokiez Edibles Grapefruit Gummiez 1pc 50mg SATIVA-Enjoy the delicious flavor of sweet and tangy grapefruit picked straight from the tree. 1 Gummiez piece with 10, 5mg servings of active THC, approx. 50mg/ package. 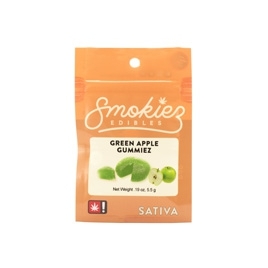 Smokiez Edibles Green Apple Gummiez 1pc 50mg SATIVA-Enjoy the delicious flavor of sweet and tangy green apples. 1 Gummiez piece with 10, 5mg servings of active THC, approx. 50mg/ package. 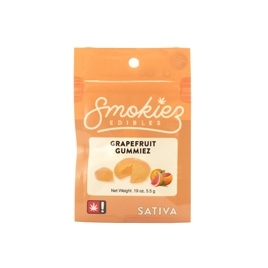 Smokiez Edibles Sour Grapefruit Gummiez 1pc 50mg SATIVA-Enjoy the delicious flavor of sweet and tangy grapefruit picked straight from the tree with the sour twist everyone loves. 1 Gummiez piece with 10, 5mg servings of active THC, approx. 50mg/ package. Smokiez Edibles Sour Green Apple Gummiez 1pc 50mg SATIVA-Enjoy the delicious flavor of sweet and tangy green apple with the sour twist everyone loves. 1 Gummiez piece with 10, 5mg servings of active THC, approx. 50mg/ package. Smokiez Edibles Sour Grapefruit Gummiez 1pc 50mg SATIVA-Enjoy the delicious flavor of watermelon right off the vine with the sour twist everyone loves. 1 Gummiez piece with 10, 5mg servings of active THC, approx. 50mg/ package. Smokiez Edibles Watermelon Gummiez 1pc 50mg SATIVA-Enjoy the delicious flavor of watermelon right off the vine. 1 Gummiez piece with 10, 5mg servings of active THC, approx. 50mg/ package. 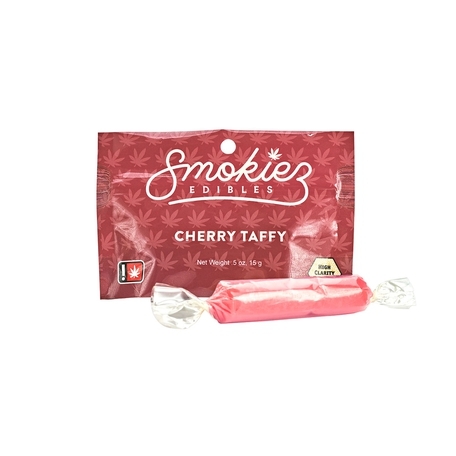 Smokiez Taffy is juicy and delicious! Handcrafted in small batches and created with the finest ingredients, these Taffy products are sure to please your customers. Available in 5 amazing flavors. 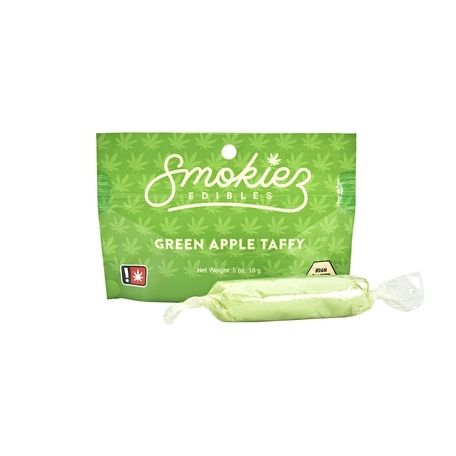 Smokiez Taffy is juicy and delicious! Handcrafted in small batches and created with the finest ingredients, these Taffy's are sure to please your customers. Available in 5 amazing flavors.